Ouch. 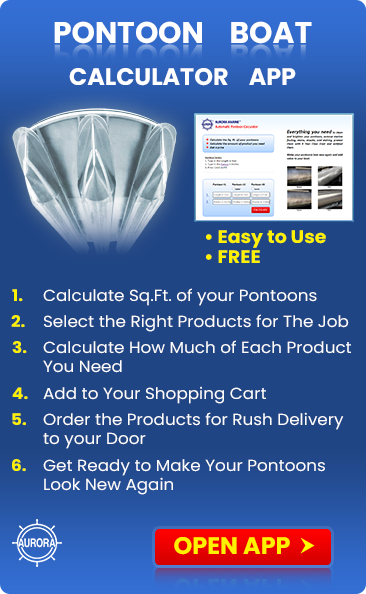 I trust you are talking to "they" about covering the cost of restoring your boat. While you’re at it, find out what make and type of paint they sprayed in case you have problems removing it. Some paint is more difficult to remove than others, especially if it’s been on the boat for a while and becomes fully cured. To get all the paint off, you’ll need to strip all the surfaces and re-protect them. I suggest that you work at one section at a time and not try to do the entire boat. Whatever you do, DO NOT use paint stripper or any harsh solvent. They can permanently damage the surfaces. Scrub with a Marine Power Mitt. If some specks still remains, apply Boat Scrub, full strength to the mitt and scrub them away. 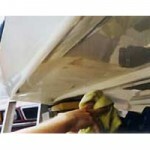 If the surfaces have been protected with Premium Boat Shine or VS721, the paint should release fairly easily. 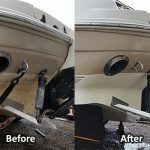 If the surface is not properly protected and the paint still remains, you will need to resort to wet sanding with 800 to 1,000 grit wet sandpaper and then go over that with Boat Clean Plus and Boat Scrub. When the paint is removed, polish with Premium Boat Shine, or VS721 if salt spots are problematic. 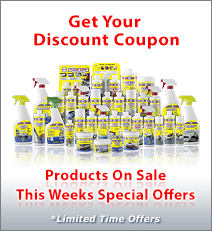 You can also use the same process to clean the stainless steel rails, cleats etc. The process will be the same as above. When the paint is removed, re-apply 2 coats of Sure Step. Clear View No. 2, the paint should release fairly easily. Use No. 1 with a clean, soft, white cotton cloth and rub the paint away. If that doesn’t get it all try rubbing with some No. 2 on a cloth. If they used a solvent based paint, the solvents in No. 2 can help release the paint. When you get it all off, re-protect with Clear View No. 2. Be careful not to get No. 1 on adjacent canvas. It’s difficult to remove. Most isinglass is set in marine canvas with zippers or snaps for holding it in place. If you have paint on the canvas, try to remove it with Fabri-Klean. Spray Fabri-Klean on and scrub with a scrub brush. If that doesn’t remove the paint, you will need to have it replaced. After you’ve removed the paint, you can re-waterproof the canvas with Canvas Shield. 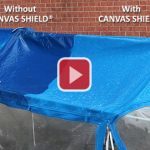 Canvas Shield is the best fabric guard using new proprietary NANOIZED POLYMER™ technology to create a hydrophobic and oleophobic coating on Sunbrella and other marine fabrics. 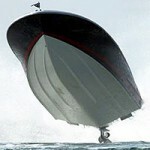 Just spray it onto your boat canvas. It’s clear so there is no color change and no milky appearance while maintaining the texture, feel and breathability. It is so effective that you can watch it waterproof a regular tissue paper here.